Cheese enchiladas, mex. rice, refried beans & a couple tacos. Other than the rice, everything were frozen leftovers. 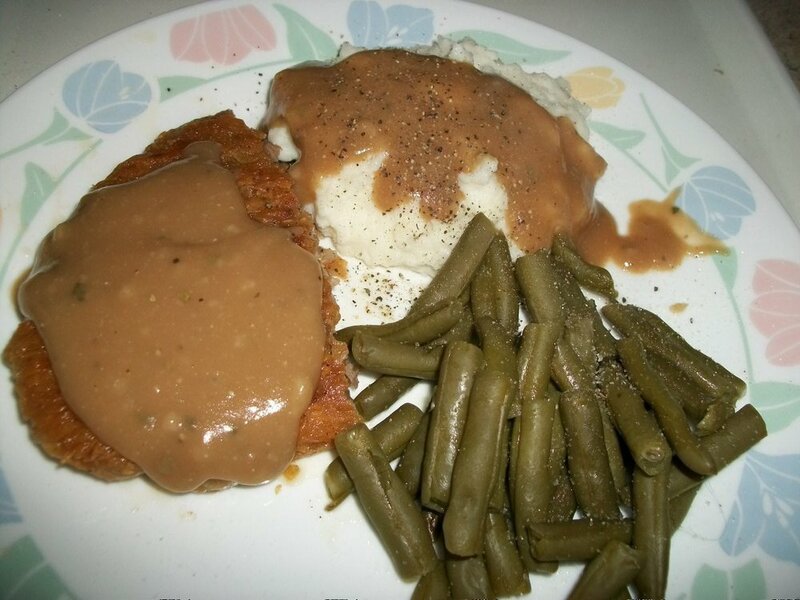 Tonight we had breaded beef tenderloins, mashed potatoes w/home made dry beef gravy mix and green beans. Dessert was fruit. Oh...ladies...on the beef gravy mix, I added a pinch more of the dry, added a tablespoon on Kitchen Bouquet and a tablespoon of milk. Turned out really creamy and a darker color. Tonight was herb/buttered chicken fillets, herb/buttered potatoes and pork and beans. Dessert...a banana. So I have been off work we have been trying new recipes. Tonight's was Jalapeno Popper Stuffed Peppers. I changed it up just a little, the recipe called for bell pepper but I had a pound bag of little sweet peppers and we used them. Served them with refried beans. Hubby loved them so they go in the menu rotation. Last night we had stuffed peppers also but they were Chicken Enchilada Stuffed Peppers. The only change I made was the sauce, I didn't have red enchilada sauce , I had green chili enchilada sauce. Hubby still liked them and the recipe will go in to the menu rotation also, but he wants me to make them with red sauce next time just to see what they taste like. Trying this one for the first time. I hope it's good I use this website often. Good stuff! I will probably make some no bake cookies for dessert. Salmon steaks, fries and chili beans. Baked a spiced pumpkin cake for dessert. No pics. Too tired after supper so took a nappy poo! For the kids, cheesy lil smokies & broccoli and cheese. For me, andouille sausage and salad. Well my eggplant was not any good so we revisited an old recipe using Italian sausage instead of ground beef. Beef noodle casserole using Italian sausage of ground beef. It was ok but I like cheddar cheese better I had to use mozzarella since I was out of cheddar. Made an experiment...total failure...but edible. The spice cake for dessert calmed our frustrations. 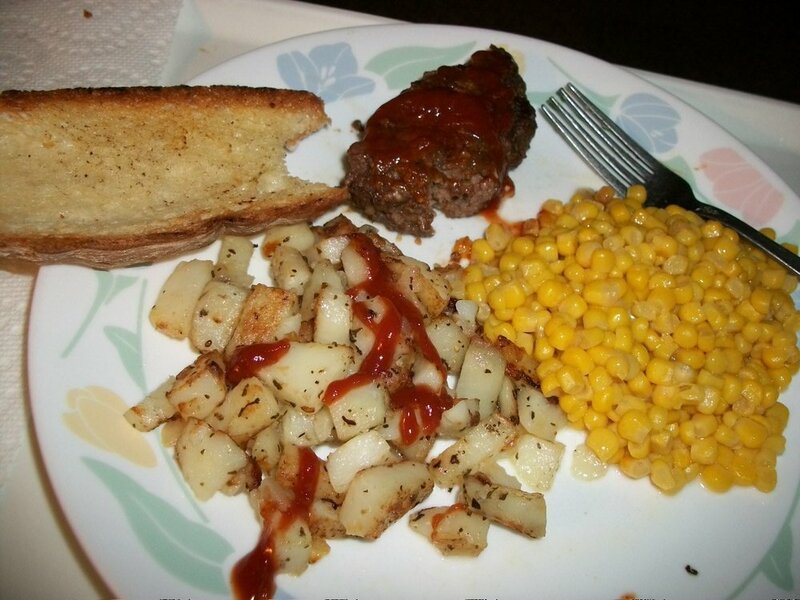 Breaded Veal cutlets, steamed red potatoes, made some gravy with my homemade dry mix, but used milk instead of water. Dessert was an oatmeal cookie ... we shared a piece of cake for our dessert at lunch. Let's see last night was hamburger steaks with grill onions and mushrooms with pepper jack cheese on top with asparagus and potato salad. To night hummmmm…. I have some left over pork I need to do something with so we are having taquitos and something not sure yet. 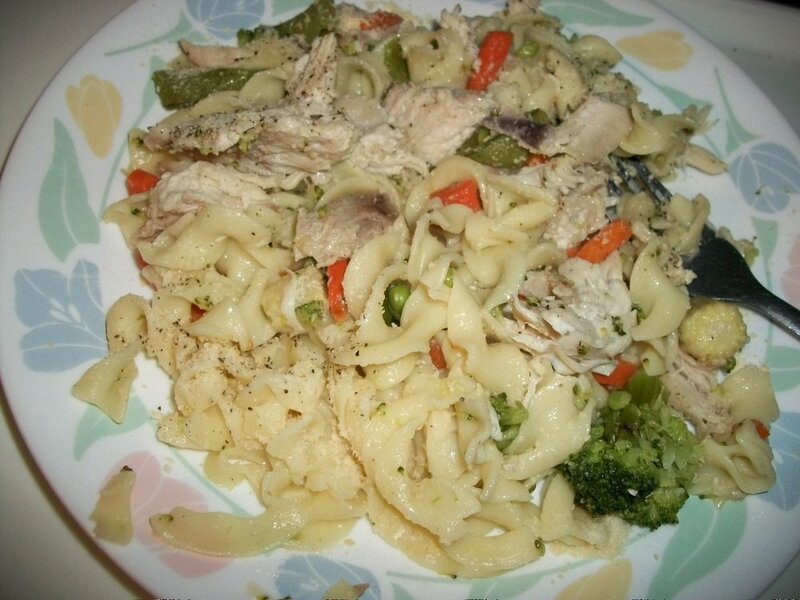 Seasoned Asian Vegetables and shredded chicken (from our own pantry) over noodles, sprinkled with parm. 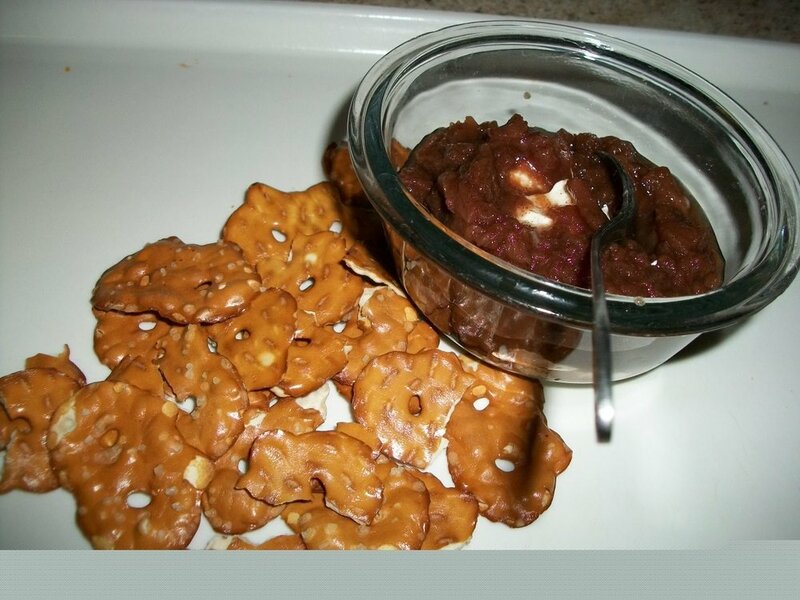 Dessert was cream cheese covered w/home preserved spiced applesauce (we like to stir it up) and pretzel crackers to dip with. Have red beans and rice in the slow cooker and will make cornbread later, all for the guys. Making appetizers for Sunday School get together tonight--ham slice and cream cheese with Italian dressing wrapped around banana peppers, cherry tomatoes and bell peepers with dip, and swiss cheese and a red grape on a cracker. Taking items that I can have! Made beef stir fry and shrimp fried rice, last night, using the mung bean sprouts. Loooong day...goulash and dessert was rest of pumpkin spice cake. Ketchup on fried potatoes and onions? Lawsy, a girl after my own heart. Fried a little crispy just this side of burned. Oh yeah. Drool. Baked chicken, cornbread stuffing and long grain & wild rice. Yesterday, leftover rotisserie chicken with bell peppers, onion and taco season on a rice cake. Today, making Honey mustard chicken in the Instant pot with cauliflower rice and broccoli mix.